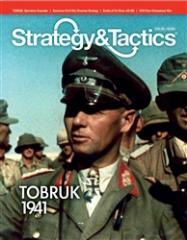 Tobruk uses the same system as Sedan: The Decisive Battle for France, May 1940. Tobruk is a simulation of British Eighth Army’s Operation Crusader, the attempt to relieve the Tobruk garrison during the period from November to early December 1941, with each turn representing two days. The units in the game represent regiments (228 counters), and operate according to a chit-pull divisional-command activation system. Movement and combat are randomized by each division’s potential activation, such that the general course of play goes a long way toward simulating the fog of war in a simple yet realistic manner and without the need for special rules. As a new addition to this system (not present in Sedan), to simulate the more pronounced effect of long-range anti-tank guns in desert terrain, units with AT capability are identified, and they’re given the capability to engage enemy armor as it approach, just as the infamous 88s did at Hellfire Pass. Each hex represents four miles, and the map area portrays the Western Desert from around Tobruk to near the Libyan/Egyptian border.